Just as much as the demand for online product shopping has exploded, so has the demand for online services. From e-books to psychic readings, there has been massive growth for brands and businesses that provide services to consumers rather than products. One notable area in which there has been much growth has been in the world of online education. With many tutors and instructors online who can provide valuable educational experiences, effective competition as a service provider is a must. Below, we’ll review a few ways that can help you better market your online courses. Above all else, you need to know what sets you apart from the rest of your competition. Is it a specific type of experience you have? Do you offer a unique climate of education that others simply don’t provide? In any online service promotion, outlining your features is an absolute must. When it comes to competition, however, you want to highlight what makes you different from the rest. This can not only help people make a decision based on what you have to offer specifically, but it can also help justify a higher price tag than what some others may be offering. Inevitably, pinging your website – as well as any off-site marketing efforts – with descriptions of what makes you unique can dramatically enhance your marketing potential. You’ll likely discover that there are many different people offering services similar to yours that vary in price. Some of the variables that can affect this include experience, platform, and the overall ambiance of the marketing experience. Ultimately, knowing the right price to offer in your marketing efforts will affect how much positive reception you receive. This is something that can be figured out in conjunction with determining your target audience: who exactly are you catering your tutoring courses to, and how much they can afford to pay? Depending on your situation, you may be able to raise or lower the prices while still enjoying just as much (or more) business. Ultimately, a bit of research into what you’re selling and who you’re selling to will help answer this question. Once you’ve figured out what makes you unique and who you’re marketing your online courses to, it becomes much easier to customize your marketing campaign for specific solutions. By knowing who you’re aiming at, you can custom-tailor your marketing campaigns in such a way that the specific solutions you’re offering match up perfectly with the specific needs of the audience. Whether you’re dealing with those who already have a foundation of knowledge in a particular subject or complete newcomers, knowing this information beforehand can make your marketing campaign much more effective. By pinging your website and saturating your ad campaigns with these solutions, you’ll really ramp up the positive reception you receive. Teachers and tutors have huge potential audiences online, but targeting specific people is key. 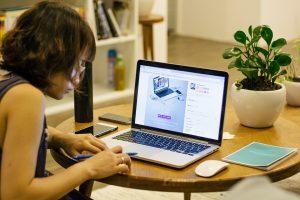 If you can outline what makes you unique, offer solutions for specific demands and understand what price point works best for your offerings, you can easily grow your online education service by leaps and bounds.